Pumpkin coffee, pumpkin tea, pumpkin beer, pumpkin vodka, pumpkin Oreos, pumpkin Pop Tarts, pumpkin cereal, pumpkin waffles, pumpkin bagels, pumpkin cream cheese, pumpkin M & Ms, pumpkin gum, pumpkin peanut butter, pumpkin hummus, pumpkin nuts, pumpkin chips, pumpkin yogurt, pumpkin ice cream…Of course, pumpkin should usually be written as “pumpkin,” since frequently it’s pumpkin flavor and not real pumpkin being used. Are you suffering from pumpkin fatigue? Has it become just a little too much of a good thing? If so, prepare for a delicious fall cocktail with not one single ounce of pumpkin or “pumpkin” in it. This is my favorite fall cocktail in the world, and I am resurrecting it from my archives to provide you with a delicious non-pumpkin alternative. This drink was created by my incredibly fabulous friend Beth, cocktail genius and CEO of organic beverage company SIPP. I highly suggest you use SIPP Ginger Blossom soda if you are lucky enough to get your hands on some. It’s worth the effort and price, please believe me. However, you can also use a premium brand ginger ale with good results, too. It has been almost twenty-one years since I’ve been a blushing bride, long before the days of wedding websites, Pinterest, and signature cocktails. I can only imagine how much fun I would have planning a wedding with all of today’s options available! The good people at Lover.ly approached me recently about sharing a favorite fall cocktail, and I was very happy to oblige. If you are looking for a wonderful wedding planning resource, I hope you will check them out. Combine vodka and apple cider in a cocktail shaker. Pour in glass. Top with sprinkle of cinnamon and nutmeg, then splash of ginger ale. Garnish with apple, if desired. Cheers, friends! 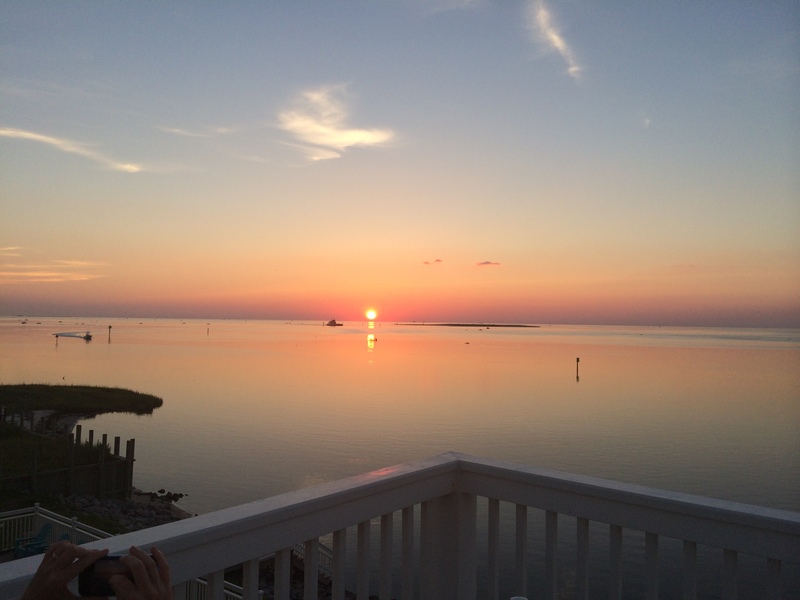 Greetings from Hatteras Island, North Carolina, where I am vacationing with my favorite two sister-wives and their families. You can read all about these awesome women in my New Year’s Eve post here. 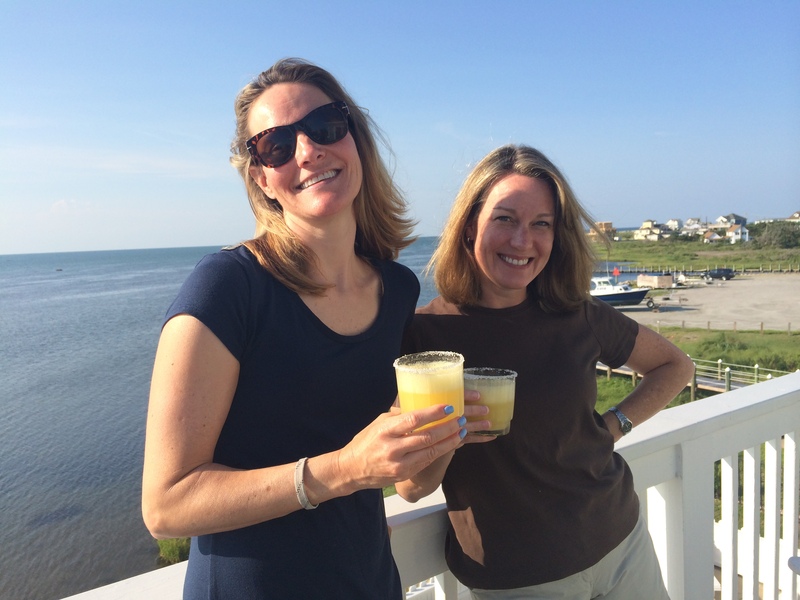 While some people might think vacationing with fifteen people might not be relaxing, you haven’t met us! We have managed to spend a harmonious week together and also squeezed in a decent amount of activities (sure, my “activity” might be beach reading and online shopping while others chose kayaking to a remote island, but there is no judgement here). Preparing meals for fifteen people is surprisingly less daunting than it sounds if you have good helpers, good music, and good cocktails. Okay, that’s not true, exactly. The good cocktails may lead one to say, ehh, let’s skip dinner and just eat appetizers and ice cream and dance all night. But you will press on and feed the children anyway, since you are a responsible adult plus six of the children don’t belong to you. Warning: These go down very easy. This is my favorite margarita in the world. Its beauty is in its simplicity. This is so flavorful, refreshing, and somewhat virtuous/healthy feeling since there are three pieces of whole fruit in each pitcher. Nature’s scurvy fighter with a kick! 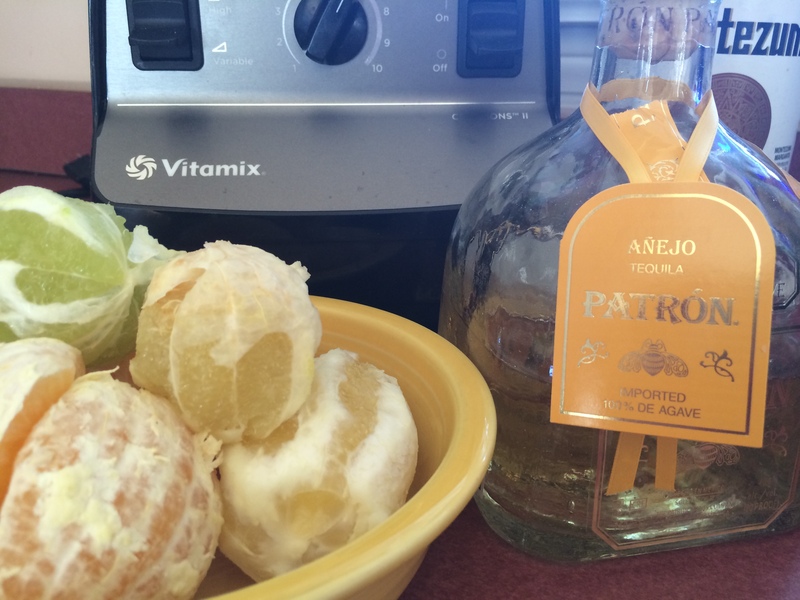 I never really liked margaritas until I discovered “better” grade tequila and not the crap I drank in college, so I would suggest springing for halfway decent tequila if possible. Cheap triple sec is fine, though. This is a Vitamix recipe, so if you don’t have a Vitamix, be sure to use another heavy duty blender that can easily handle the fruit (seeds included) and the ice. My only modification from the original recipe is that I use less ice; they call for six cups of ice, which is overkill and cannot really fit in the blender anyway. It’s also very good with “only” five tablespoons of sugar instead of six. Each pitcher serves four to six, depending on your glass size and need for strong drink. Cheers! This recipe has been written for the Vitamix 5200 with Standard 64-ounce container. If you are using a different Vitamix machine or container size, you may need to make adjustments to the Variable Speed, processing time, and/or ingredient quantities. Happy New Year, friends! I know 2012 has been a tough year for some people, and I’m sincerely sorry about that. If this hasn’t been your best year, I hope 2013 is happier, healthier and more fulfilling. However you are spending the night, please have fun and be safe. We are lucky, once again, to be ringing in the new year with our special friends. Nothing too elaborate as far as food this year, but I am excited to be serving my first dish with a wee bit of caviar. As a dedicated sushi lover, I have enjoyed sprinkles of caviar here and there over the years, but I never have used it in my own recipes until today. Salmon roe, often referred to as red caviar, is the star of this dish. We are fortunate to have caviar from New York City’s Caviar Russe offered at our grocery store. Since this recipe only uses 50 grams of salmon roe (1.75 ounces), you probably won’t need a home equity loan to serve this at your next party. Assuming you are able to acquire just a small amount of caviar, for under twenty bucks you will have a delicious dish that will dazzle your guests and make you feel like Robin Leach himself! Beat cream cheese until smooth. Add sour cream, lemon juice, scallion, salt, milk and dill until well combined. With mixer turned off, gently fold in about 7/8th of caviar with rubber spatula. Spoon into serving dish, and garnish with remaining caviar and sprig of dill. An Ina book signing is like the Grateful Dead for suburban stay-at-home-moms. My friend and I arrived to stand in line at 9:30 for the book signing of Barefoot Contessa Foolproof which begun at noon. We gathered en masse, a line of Burberry and Tory Burch and Maclaren strollers as far as the eye could see, giddy with anticipation to see our mutual idol. We swapped stories of favorite recipes and little known Ina facts. We paid respect to Jeffrey. The general atmosphere was a strange mixture of reverence and exuberance. When it was finally our turn, I could hardly breathe. Suddenly I understood how people could join a cult. If Ina had asked me to sell all my worldly possessions and move into her East Hampton compound as a dishwasher, I probably would have done so at that moment. She radiates goodness and light and is so beautiful in person. I don’t just love her, I looooovvvvvvveeeee her, and seeing her up close was almost like looking directly into the sun; I was a little dizzy. Believe it or not, I don’t own any Ina cookbooks aside from her latest (ahem, autographed copy). This recipe was the first to catch my eye, and I couldn’t wait to have a moment to try it. I have been so busy this season, and I realize that I need to start getting my New Year’s Eve appetizers picked out since we are hosting again. (Click here for more info on how I spend my New Year’s Eve). I thought I would preview these before serving them to guests. I thought they were fabulous, though Ed didn’t really care for them…but he’s always like like blah blah blah cholesterol. I know I will served them again at some point in the future, but probably for a more casual affair than New Year’s Eve. The sweet/spicy/crunchy/salty combo is a winner in my book. Preheat oven to 375 degrees. In food processor, combine sugar, nuts, salt, pepper and cayenne until finely ground. Add maple syrup and pulse until moistened. Ina suggests using a wire baking rack on top of a sheet pan lined with foil, but I used a slotted broiler pan lined with foil with good results. Whatever you use, be sure the fat has a place to drip to prevent sogginess. Cut bacon in half and spread evenly with sugar mixture. 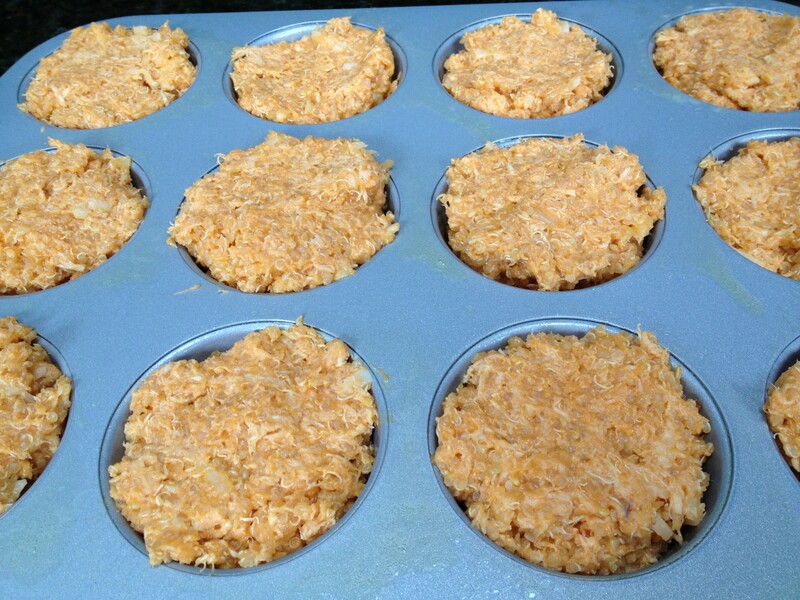 Bake 25 to 30 minutes and let cool to room temperature before serving. 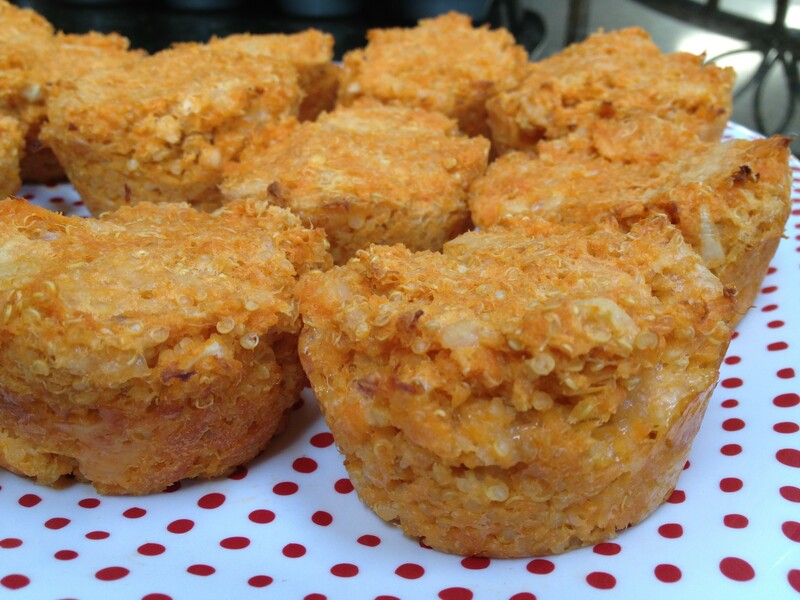 One of the first recipes I posted to this blog was Dawn’s Famous Roasted Red Pepper Hummus. 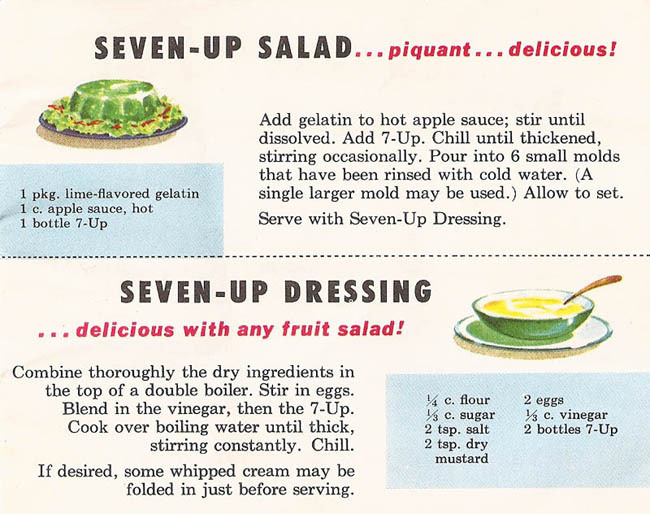 It is, perhaps, my most requested recipe in real life. As I mentioned, most Friday nights Ed and I have hummus, bread and wine for dinner. We relax and unwind after a tough week and look forward to the promise of another weekend. After many years of doing this, you’d think we’d be sick of it by now, but surprisingly, we are not. In fact, on the rare Friday we skip our hummus and wine, we always feel a little sad, a little off — even if we did something else fun that night, which is usually the case. I don’t know how many more years this ritual will last, but we both love it so much that I can’t imagine stopping it anytime soon. 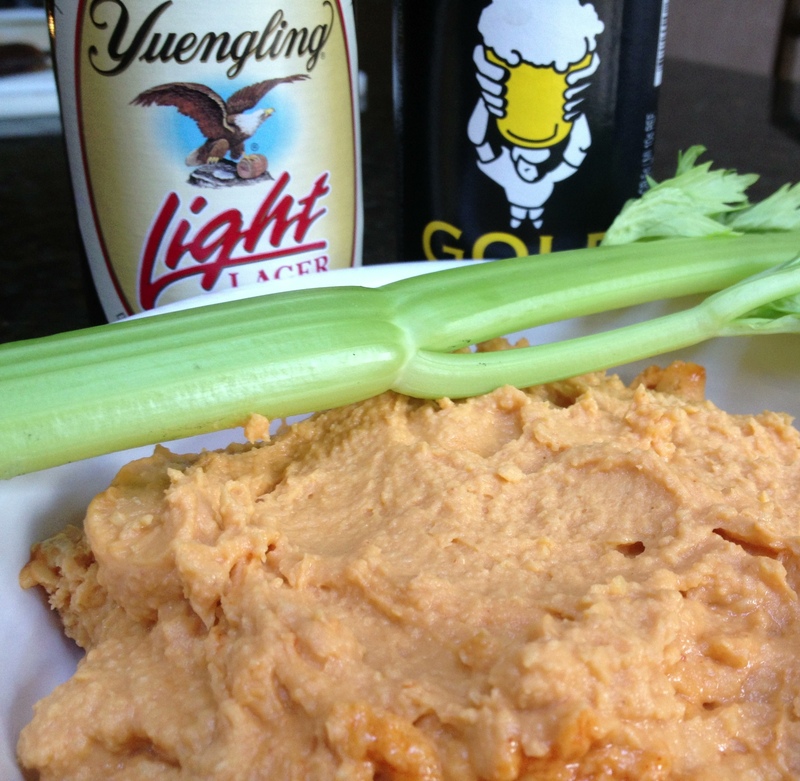 Hummus is everywhere these days, and there are some interesting combinations available. (And sometimes there is a thin line between interesting and weird.) Tonight I decided to add caramelized onions to my traditional recipe, and I’m so pleased with the result. Rich and sweet, but not overpowering. I took my tried and true recipe, omitted the red peppers and cayenne, added a few dashes of cumin, then proceeded as usual. Once the hummus was smooth, I added the caramelized onions and pulsed about 30 seconds until just combined. Since it is a lovely shade of beige, I added just a small sprinkle of parsley. I learned that proper French chefs never leave white or light foods unadorned. One of the coolest gifts I ever got was this Crate & Barrel Herb Scissors. (Thanks, Sue!). For those of us with sub-par knife skills (hello! ), this is a lifesaver. 1 can chick peas, 15.5 oz. 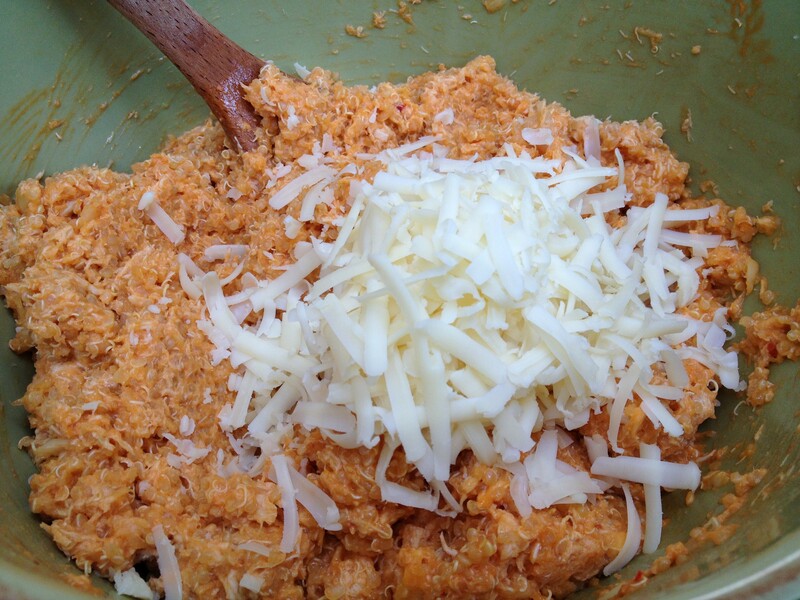 Combine the first four ingredients for about one minute in food processor. Scrape sides, then slowly add lemon juice from top chute while food processor is running. 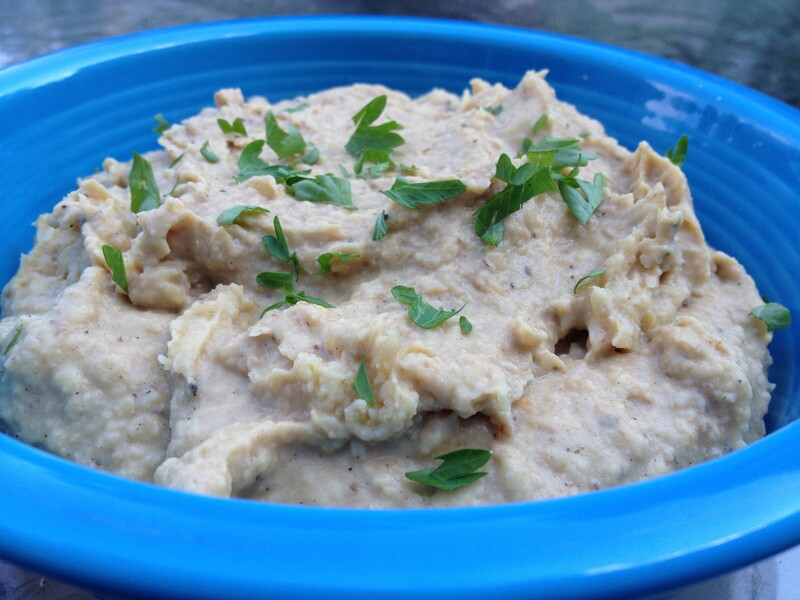 In a small cup or bowl, mix together tahini and olive oil until very well combined, about a minute. With food processor running, add the tahini mixture until incorporated, about 30 seconds. Add the caramelized onions and process just until incorporated, about 30 seconds or less. I hosted book club last night. Like most ladies of a certain age around here, I love my book club. Book clubs are like sororities for middle aged women: they’re not always easy to break into, and it’s important to choose the right one. Or, in my case, be chosen by the right one. Our appreciation for a good book is only exceeded by our appreciation for good gossip, naughty food, and a glass of wine or two three four. Even though I’ve known many of these ladies for years, I wasn’t invited into the book club until fairly recently, which I completely understand. I, of all people, respect the importance of limiting size, the right kind of chemistry, etc. I think we’ve all had our negative group experiences in the past, and one can’t be too careful about messing around with the balance of a successful group. When I went to my first meeting at the Mayonnaise Heiress’s house, I couldn’t believe my eyes. Uh oh, I thought, I am in over my head! I’ve been to weddings with far inferior food and wine than this (ahem, none of my friends, of course). I learned that some people go all out and some people really go all out, but a certain standard exists, and I’d better be up for the challenge. If it means tapping into my home equity line of credit to buy the wine, so be it. Even though I obviously like to cook, I’ve learned not to be a martyr. I try to have a few special homemade items, and then I supplement with some easy packaged or prepared items (chips, things for the candy dish, etc.). 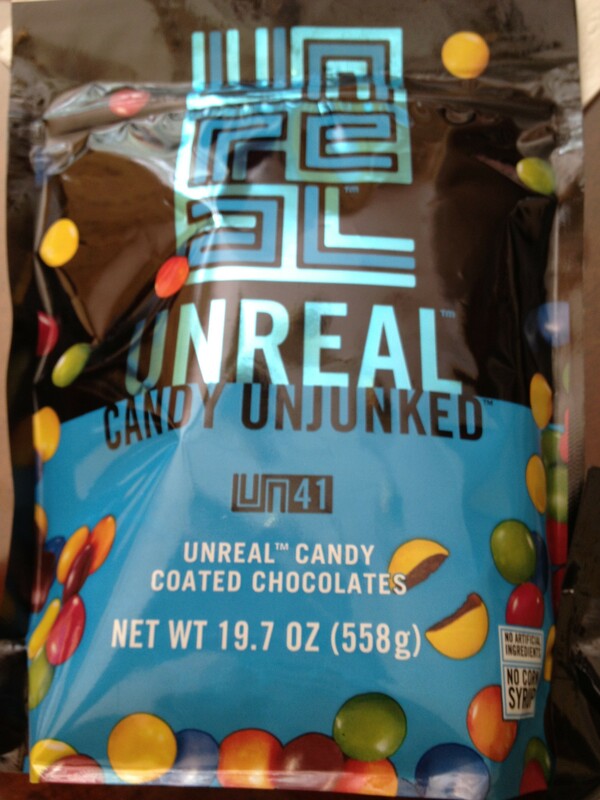 I was all set to go with Lindor truffles and an assortment of Hershey products when I found this in BJ’s: UNREAL Unjunked Candy. Adam was so inspired by the mission of changing junk food that he immediately brought together top scientists and chefs all across Europe to recreate America’s biggest selling candies, without the junk. Along the way Nicky and Adam developed UNREAL™’s mantra: “Unjunk™!” Corn syrup? Out. Partially hydrogenated oils? Out. GMOs? Out. Artificial colors, flavors, and preservatives? Out. Reduced sugar by over 40% per serving on average? Check. They also decided key ingredients needed to be responsibly sourced, supporting farming communities and preventing destruction of the rain forests. All ingredients needed to be non GMO. Dairy needed to come from pasture raised cows with no antibiotics or added hormones. Why? Because it’s the right thing to do for people and the planet. But the real question, of course, is how does it taste? 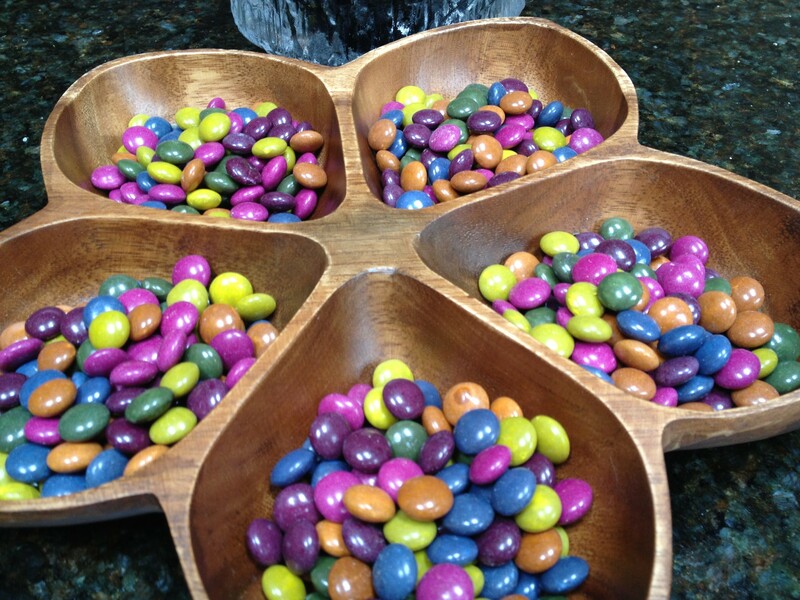 I bought the M&Ms and the peanut butter cups, and both were a big hit with my kids and with my book club friends. It probably goes without saying that the flavor is not exactly the same — not worse, just different. If you are expecting an identical substitute, it will taste “off.” But if you are expecting a yummy, unjunky, chocolatey treat, you won’t be disappointed. My favorite part is from an aesthetic standpoint. The colors, dyed with beetroot juice, turmeric root extract, and purple cabbage juice, are absolutely stunning. These are high class M&M’s worthy of the most discriminating book clubs. One of my happiest and earliest memories is my Pop Pop Nate taking me to the Roosevelt Mall in Northeast Philadelphia and buying me a cherry water ice and a soft pretzel. The warm, salty, chewy pretzel was the perfect compliment to the cold, sweet water ice. We would sit on the metal mesh bucket seats outside the John Wanamaker department store and watch the people pass by while enjoying our treats. After cleaning up with the moist towelettes Pop Pop always carried, we would walk across Cottman Avenue to the library and pick up more Madeline books to read together. Years after Pop Pop died, whenever I heard Christopher Plummer narrating the Madeline cartoons on PBS, starting with “In an old house in Paris that was covered with vines, lived twelve little girls in two straight lines” and ending with, “And that’s all there is — there isn’t any more,” I would choke back my tears. Every child should feel as loved and adored by her grandparents as I did. When I saw this pretzel recipe in Fine Cooking, I knew I needed to try it. Soft pretzels are such a part of my personal history as a Philadelphian and I will always feel a fondness for them, even though they are not especially exciting (or good for you). This Fine Cooking recipe uses food-grade lye, but I am not comfortable with that. Apparently lots of other people aren’t either, since they also offered an alternative which I chose to use. Both options are included below. Well, it turns out the humble little Philly soft pretzel is a bit of a production. Not quite the production of making bagels, but a production nonetheless. The main thing you will need is time…time to knead, time to rise, time to roll out, time to freeze, time to coat and bake. It’s a fun project for a day when you’re happy to stay home and bake. Once you shape the pretzels, they can stay frozen for as long as three weeks before thawing and baking, so that’s an option if you’re not looking for an all day affair. In a stand mixer fitted with the dough hook (or in a large mixing bowl with a whisk), combine the yeast and 1-1/2 cups lukewarm (90°F to 95°F) water and let stand until dissolved, about 5 minutes. (The mixture should smell yeasty. If it doesn’t, start over with a fresh batch of active dry yeast.) Add the flour, sugar, oil, and salt. Mix on low speed (or with a wooden spoon) until the ingredients are hydrated and form a coarse ball of dough, 2 to 3 minutes. Add more water as needed, 1 tsp. at a time, if all of the flour is not incorporated into the dough. Increase the speed to medium low and mix (or transfer the dough to a work surface misted with oil and knead by hand) until the dough becomes smooth, supple, and elastic, about 3 minutes. The dough should be soft but only slightly tacky; if it seems sticky or very tacky, sprinkle in more flour, as needed. 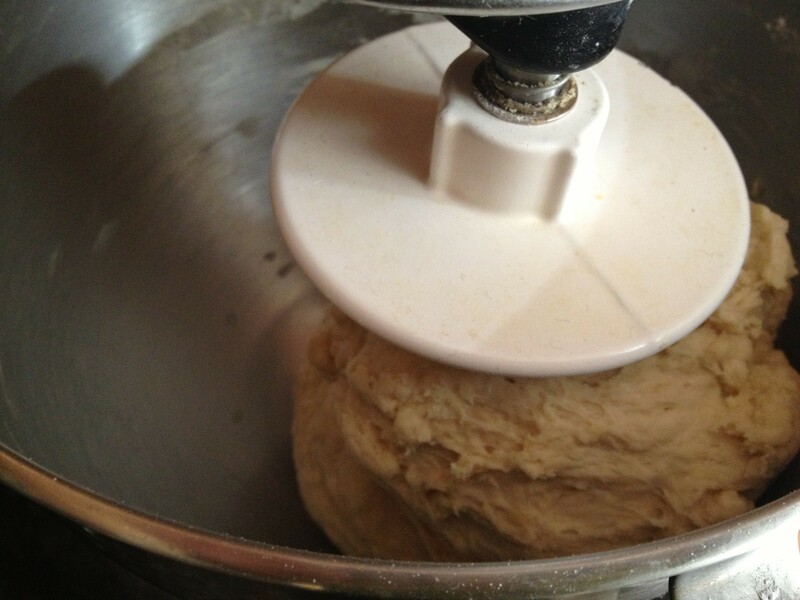 If using a stand mixer, transfer the dough to a lightly oiled work surface and knead by hand for a few more seconds. 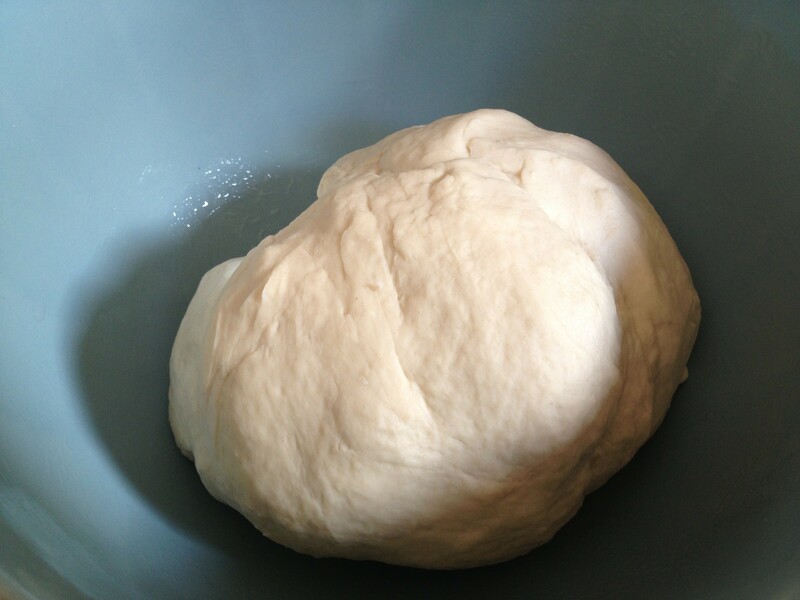 Form the dough into a ball, transfer to a large, lightly oiled bowl, cover with plastic wrap, and let rise at room temperature until it’s about 1-1/2 times its original size, 1 to 1-1/2 hours. Lightly mist a work surface with oil and transfer the dough to it. 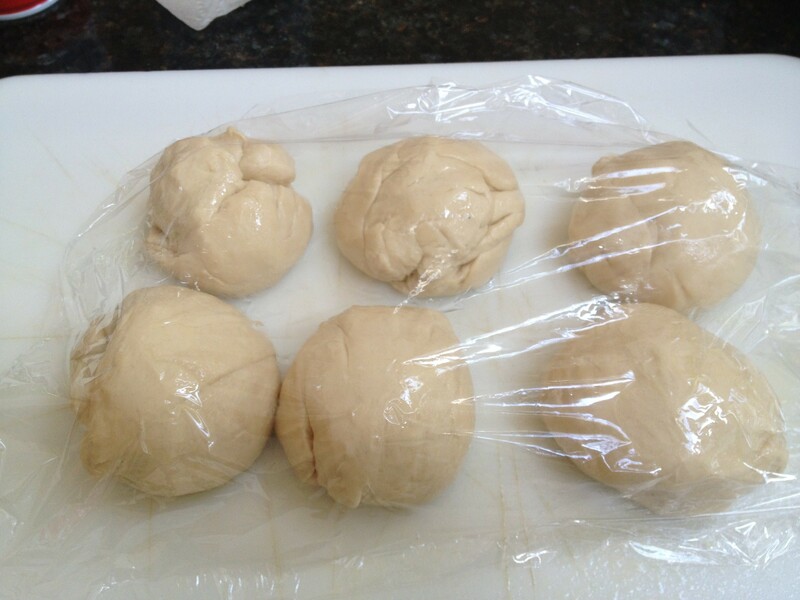 Divide the dough into 6 equal pieces (about 6 oz. each). Form each piece into a smooth, round ball, lightly mist with oil, and cover with plastic wrap; let rest on the work surface at room temperature for 20 to 30 minutes to allow the gluten to relax. Line a large baking sheet with lightly oiled parchment or a silicone baking mat and set aside.Lightly mist a work surface and, using your palms and fingers, roll each piece of dough on the work surface into a rope that’s about 30 inches long and 1/3 to 1/2 inch thick. If the dough resists or shrinks back, let it rest for a few minutes while you work on other pieces; short rests will let the gluten relax enough to allow for the full rollout. Working with 1 dough rope at a time, shape it into a large U that’s 5 to 7 inches across with the curve closest to you. Take the 2 ends of the rope in your fingers and cross one over the other so the ends overhang the cross by about 3 inches. Twist the ends of the rope, shortening the overhang to about 2 inches. Next, pull the twisted end section toward you and fold it down over the bottom curve of the U so the ends are a couple of inches apart and overhang the bottom by about 1/4 inch. Carefully transfer the pretzels to the prepared baking sheet, spacing them evenly and reshaping as needed. Cover with plastic wrap and freeze until hard, at least 2 hours and up to 3 weeks. If using lye, put on protective gloves. Pour 2 cups cool water into a small stainless-steel bowl just wide enough to hold one pretzel.Add the lye and stir with a stainless-steel whisk or spoon until completely dissolved. If using baking soda, bring 2 cups water to a boil in a small saucepan. Remove from the heat, add the baking soda, and stir until completely dissolved. Transfer to a bowl and let cool to lukewarm, about 30 minutes. Using stainless-steel tongs or a stainless-steel slotted spoon, dip one pretzel at a time in the lye (or baking soda) bath and soak for 5 seconds. If the liquid doesn’t completely cover the pretzel, turn it over and submerge the other side for 5 seconds. Remove the pretzel from the liquid, allowing the excess to drip off, and return it to the baking sheet. To discard the lye bath, slowly pour it down the sink drain and flush with cool running water for a few seconds. If you wore non-disposable gloves, wash them in cool soapy water and rinse well. 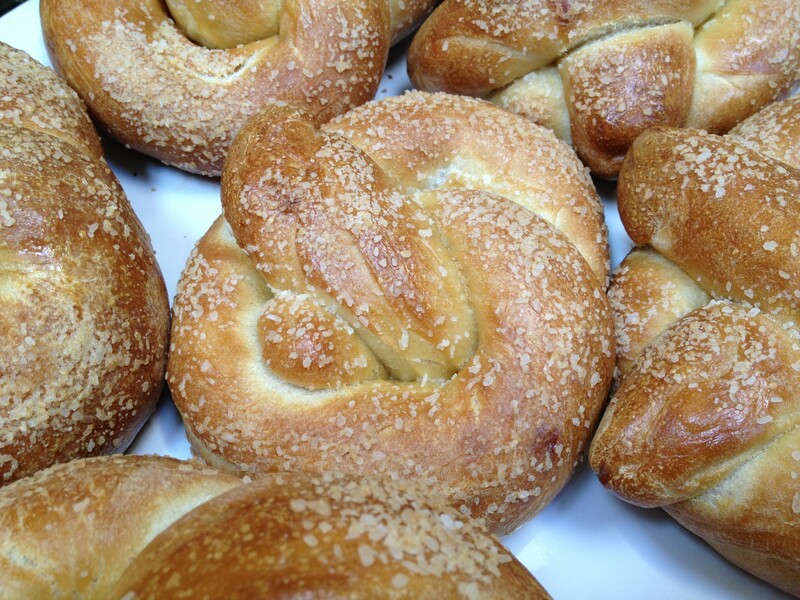 If you used a baking soda bath, brush the tops and sides of the pretzels with some of the beaten egg. Let the pretzels thaw and rise at room temperature until they are soft and puffy, 1-1/2 to 2 hours. Position a rack in the center of the oven and heat the oven to 400°F. 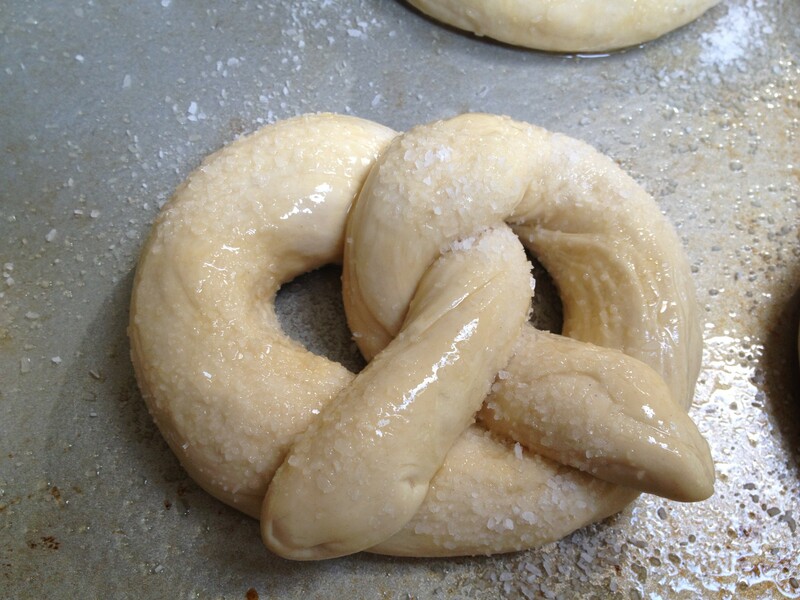 Brush baking-soda-dipped pretzels once more with egg.Lightly sprinkle the pretzels with the salt. Set the baking sheet of pretzels on another baking sheet (double-pan them) to prevent the bottoms of the pretzels from browning too quickly. Bake, rotating the pan halfway through, until rich, deep mahogany-brown for lye-dipped pretzels or dark golden-brown for baking-soda-dipped pretzels, 20 to 22 minutes. Transfer the pretzels to a rack and cool for at least 15 minutes before serving. In my ongoing quest to find a healthy chip substitute, today I whipped up a batch of Brussels sprout chips. I am embarrassingly excited about how delicious these are! Seriously, so good. I wish I had made more, but I only made a small experimental batch. I would say these are even easier than kale chips, since the leaves come off in less time and minimal knife skills are required. I flavored mine with salt, cayenne pepper and garlic powder, but feel free to use your imagination. Preheat oven to 350 degrees. 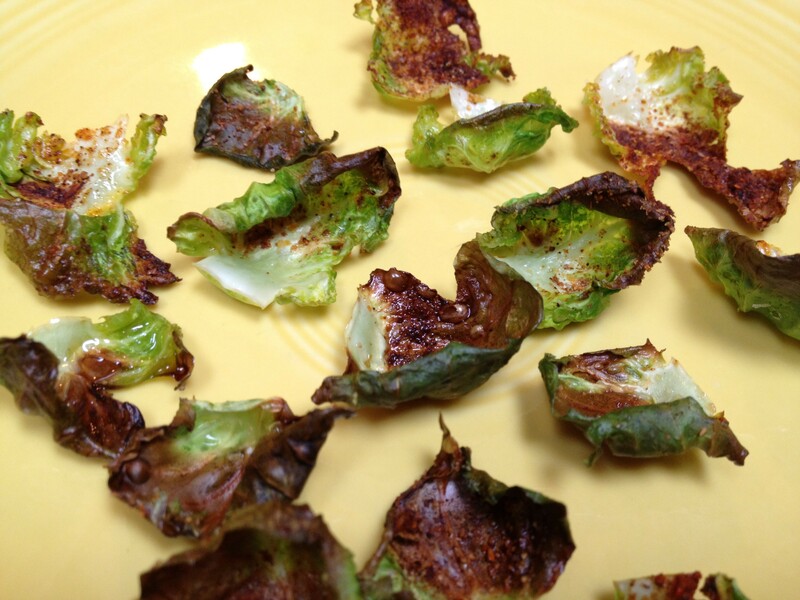 Place Brussels sprout leaves on baking sheet. Spray evenly with cooking spray. Add salt, cayenne, garlic powder, or flavoring of choice. Check on these after five minutes. They brown quickly but still taste delicious on the well done side.